I am that type of person that usually drifts towards the more chocolate offerings on a dessert menu. I am, by far, unapologetically and absolutely, a chocolate person. The darker, the better. The more layers of it, the happier I am. Chocolate chip brownies a la mode with chocolate ice cream? I am all for it. Chocolate soufflé with chocolate sauce? Yes, please. Nothing pleases my soul more (except for chicharon and bacon which are, to me, chocolate’s savory equivalent…a gift from the gods). That said, I also have this uncanny, and opposing, love for plain yellow loaf cakes. Yes, true. I won’t even say pound cakes or butter cakes because they don’t really have to be either. They just have to be a sunny, unfancy, yellow loaf and the same part of me that loves hot chicken soup and my baby pillow cries out for it. There is something in its comforting solidity, its familiarity and plainness, that makes me want to take a thick slice and just cozy up to it. They are also, usually, a breeze to throw together, so a craving is never too far from sated. This one is no exception. It’s been on my to-make list since I bought this cookbook, my beloved copy of Nigella’s How To Be A Domestic Goddess. Predictably though, I was waylaid by several chocolate recipes before I could get to this one. I’m so glad I finally did. – Cream the butter and sugar until light and fluffy, and then mix in the lemon zest. – Add the eggs to the butter/sugar mixture, one at a time, with a tablespoon of flour for each. – Gently mix in the rest of the flour, to which you have whisked in the baking powder. Add the lemon juice and mix until just combined. 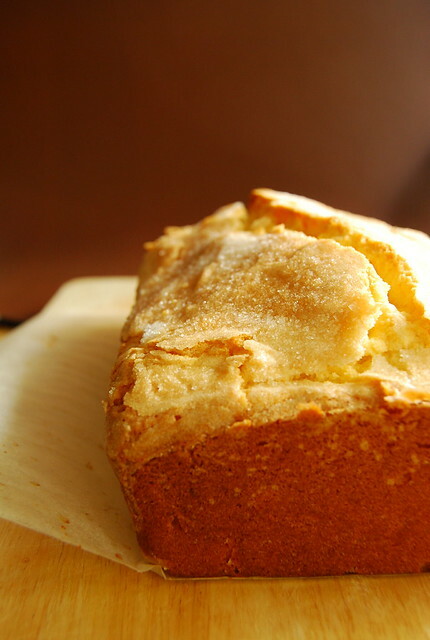 – Scrape the batter into a buttered and parchment-lined loaf pan and sprinkle the 2 tablespoons sugar on top. Bake in a pre-heated 170C oven for 55 minutes – 1 hour or until a skewer comes out clean. – Remove from the oven to a wire rack and cool in the pan for 10 minutes. Remove from the pan and cool completely on the wire rack. I’ve amended this recipe somewhat as the original calls for self-raising flour, which is hard to come by in these parts, so I substituted with regular flour and baking powder. Nigella also let’s this cake cool completely in the tin on a rack but I prefer to remove the cake from the tin after it’s cooled for about 10 minutes. Let me just say, at this point, amendments aside, that this book has yet to fail me. All the recipes I have tried thus far I have liked, if not loved. My first ever post on this blog, seven years ago, was about the Burnt-Butter Brown-Sugar Cupcakes from this book. I’ve also tried the Dense Chocolate Loaf Cake, Store-Cupboard Chocolate Orange Cake, and Torta Alla Gianduja…all to great response. I even love her Spiced Apple Chutney, which I have made many times since, and has served me well in the homemade gift-giving department. So, firstly, thank you Nigella! This recipe one is no different from the others I’ve tried – a winner. For me at least who does love this sort of cake, and even for C who usually doesn’t. It bakes into a wonderful golden loaf, with a soft buttery crumb, and a sugar encrusted, crackly top. A traditional British teatime cake, I can also imagine this would make an excellent base for that other traditional British sweet, the trifle. Nigella’s, or rather, Nigella’s mother-in-law’s version is light and lemony. It is lovely on its own (or indeed with a cup of tea) or topped with fruits and cream, or, if your feeling indulgent, a generous scoop of ice cream. The week’s almost over so hang in there troops…heat and power outages be damned! And here’s to baking your cake, no matter what flavor or color, and eating it too! So tempting! This cake looks marvelous. Love the sugary cracked top. Makes u wanna dig in straightaway with a fork. This madeira cake looks delicious. Oh gosh! It looks rich, buttery and creamy…I can almost smell it. What a divine cake! Although – like you – I do love me some chocolate, I have a particularly soft spot for plain (yellow or white) cakes! They are for days when I want nothing but simplicity and pure cake-y deliciousness….Ahhh…I'm dreaming of biting into this boozy cake! Yes to Madeira as well! oh my!! this looks so good. this cake looks good…i'd like to try it but i don't have a scale. how do you convert the measurements to cups and table/teaspoons? btw, what's caster sugar? thanks! It looks so good but a little complicated or maybe I should say time consuming. I would love it if it had some chocolate somewhere in there. I love more of the plain cakes, because it usually means less calories. The first thing I thought about when I saw the cake was, don't worry about a plate where is my fork? Hi Morion! So do I! I love cakes like this one, too, Joey! They're perfect paired with both coffee and tea. Wonderful to have around to snack on. And that book is absolutely wonderful – the recipes work beautifully! This cake looks incredible! And yet so simple to do. Must try it. Bookmarked. Thanks for sharing, Joey! I love yellow loafs for breakfast. It just makes me feel great as I start my day. I guess it reminds me of the sun rising in the morning. Looks yum! Good to know Saatchi Gallery mummy actually bakes. 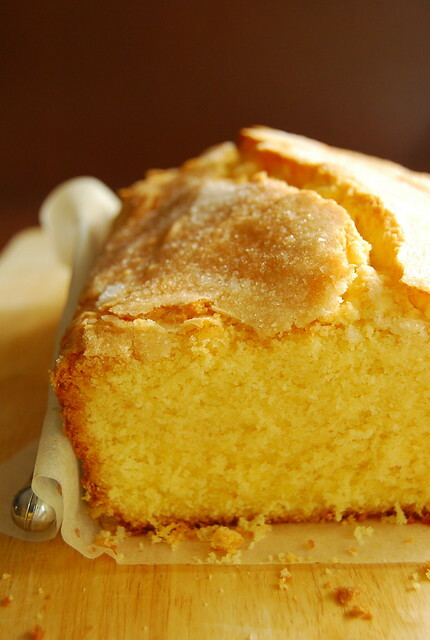 We had Madeira cake for tea a lot when I was in the U.K! It seems to be a boarding school staple, but they are usually served as hard as rocks, and therefore ideal for dining hall food fights! I was quite taken by this cake, especially after you said that it would make a marvelous base for trifle. Let's experiment and try to make one. I use the term Let's quite loosely as what I mean is you do the baking and I will do the rest. Ha ha. Hi Patricia! That book hasn't failed me yet 🙂 And love these cakes too! I just baked this after work today:) I love yellow cakes too and can't wait for the timer to ring so that I can taste it! Just made this lovely cake it’s now in the oven, the aroma in the house is so heart warming, love it . Hope you like it Irene!